LearnSmart® is an interactive, adaptive study tool that assesses students' skill and knowledge levels to track mastered topics in the course and skills requiring further practice. Based on the student's demonstrated skill and confidence, LearnSmart® dynamically adjusts the learning content to match the student's progress. 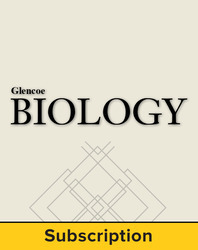 Test your students knowledge of Glencoe Biology content with LearnSmart®! Biology content comes to life as your students work their way through interactive assessments that measure and monitor their knowledge levels. Personalized study plans continually adapt based on your students performance levels as they work their way through over 6000 questions to support all 37 chapters in Glencoe Biology.